I was going through some old images and I stumbled on this one. A friend had asked to use a couple color infrared images as examples for a presentation. I had to do a little digging to find some but of the ones that I dug out, this is my favorite. A couple of years ago I converted my Canon RebelXT for infrared (IR) use. All digital sensors are sensitive to IR. So much so, that there is actually a filter, or “hot mirror”, in front of the sensor to block IR light. The conversion process removes that filter and replaces it with an opaque filter that only passes IR light. The type of image captured by the new filter depends on it’s wave length. The filter that I used is roughly 680nm. The resulting image retains some color, albeit pretty strange. Filters in the 830nm range pass no visible light so they produce strictly B&W images. This image is of a bright orange flower with a dark black center. Rather than capturing visible light, the camera is capturing only reflected IR. The results can be other-worldly. I don’t use this camera much and I’m not quite sure why. I think that I might have to bring it out more often. 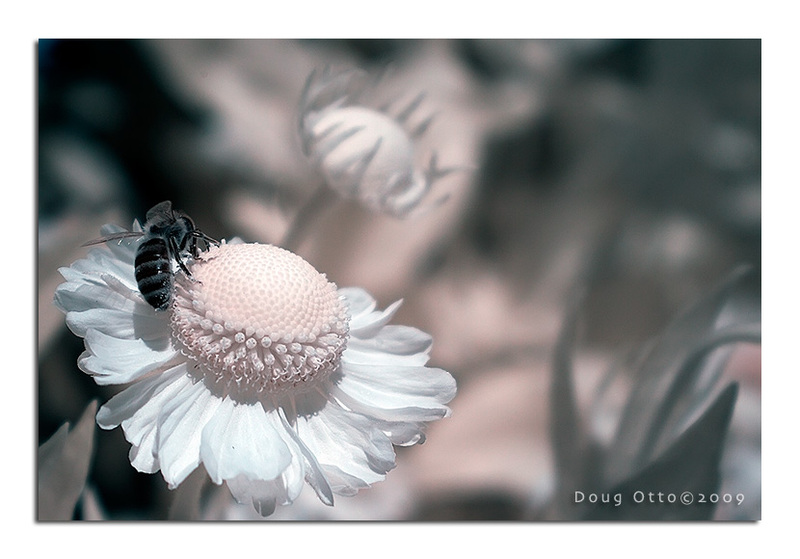 This entry was posted in Photography and tagged Canon RebelXT, DIY, doug otto, flower, honey bee, infrared, macro, Photography. Bookmark the permalink.